Large monitor users:   [W1200xH900 pixels 150KB]   images available. Click on any of the thumbnails to change the main picture selection. Two sets of pictures are available in a special Chopper Flight archive. Last evening the Big Kids attended the Washington County Fair. Notwithstanding that our minder won the Grand Reserve Champion ribbon for her Sweet Zucchini Relish, the highlight of our visit had to be the helicopter ride. After checking with the pilot that she had never crashed, although we did wonder if the accident probability is lowered by flying with pilots who have statistically fulfilled their crash quotas, we rose gently into the air. That lady has a touch like a mother with her first born. The thrilling fear and vertigo from the sensation of unsupported flight over the landscape, especially when sitting in the front passenger seat where everything from just in front of one's feet can be clearly seen through the surrounding plexiglass, was something we had never before experienced. The buzz lasted all night. Over the intercom the pilot chatted with one of the passengers who seemed to have some piloting experience, and mentioned she had a helicopter of her own. When she said she used it to go shopping at the mall, your correspondent belly laughed so hard that the momentum of such a large independently oscillating mass threatened the stability of the craft. Those Arizona gals are something else. 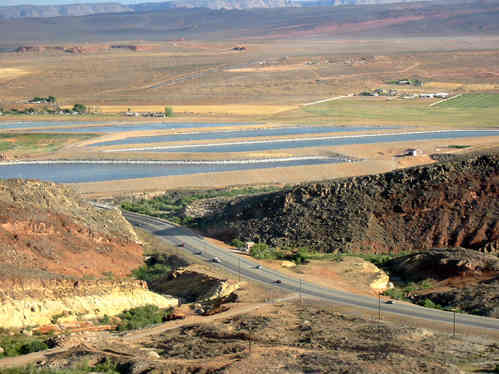 We flew out over Sand Hollow State Park reservoir, which is so new that it is still filling up and does not appear on the maps; across State Route SR-9 over the southern end of Red Cliffs Recreation Site and Quail Lake State Park reservoir; and back over SR-9 to the fairground. 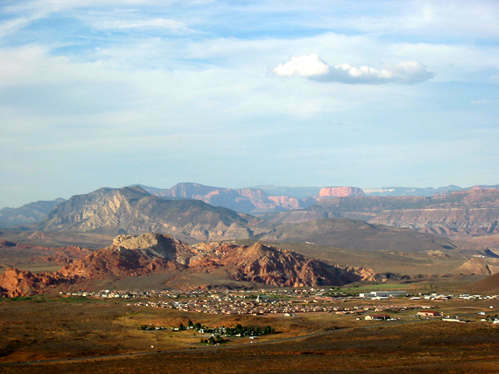 From left to right in the pictures: the County Fair site on Purgatory Flats; the cutting where the east bound SR-9 breaches the lava pillows of a volcanic dyke intrusion when heading for the town of Hurricane & Zion National Park; and the outlying community of Sky Mountain, which is built around the town owned golf course just to the south of Hurricane. 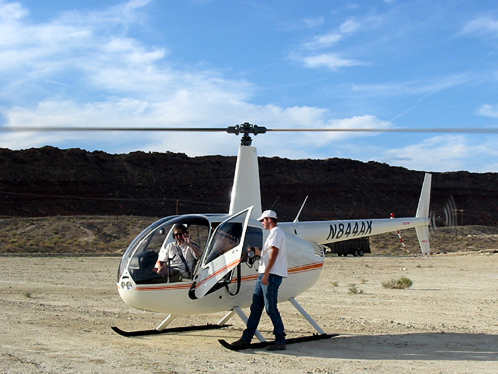 The helicopter is a Robinson four seater. Our thanks for such a wonderful experience to all the staff at a AFlightAbove.com. Tomorrow we will be featuring more pictures from the helicopter flight, plus guilt ridden confessions of gross over indulgence. 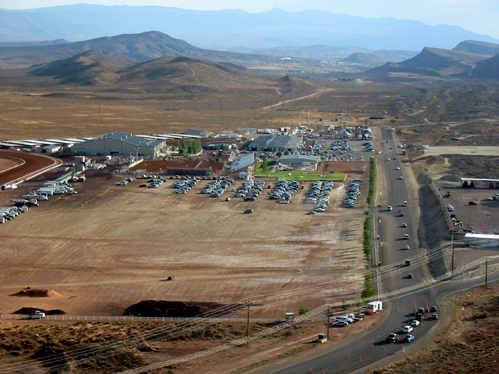 Two sets of pictures are available in a special [Chopper Flight] archive. American actor (1960- ). Perhaps best known for a TV series in which he co-starred, he also has a long list of movie credits as an actor, director, and writer. Unlike some stars who get to co-write because of their star status, this man has the academic qualifications to do the job himself. He earned an undergraduate degree from Princeton University, and a graduate degree in English Literature at Yale University. While at Yale he began to study acting in New York, and was soon appearing in off-Broadway plays. In 1987 he abandoned his doctoral studies at Yale to pursue acting full time. He has even played himself in eight TV shows. We rate that lower than a biopic movie, but he has appeared as himself (with his co-star, and Leonard Nimoy, which must have cost 'em!) in a Simpsons episode, which clearly confers star status. In the world of Simpson's episode encapsulation the Simpsons Archive at SNPP.com is comprehensive enough to fulfill the needs of most obsessives. He has also appeared on the Howard Stern Show, which is something best consigned to the cutting floor of history. Best quotes: "I'm half Jewish, half Scottish. It's hard for me to buy anything." and "I get tired of people asking if I believe in what's presented on the show. They don't ask the guys on 'ER' if they believe in euthanasia." (Oct. 1997 'Chicago Tribune' interview.) The IMDB (Internet Movie Database) entry for this star was used in the preparation of this mini bio.